It’s fair to assume that on a show like Key & Peele, and really just about any sketch comedy show, there are countless ideas pitched in the writers’ room that never actually make it to air. Some sketches, no matter how funny or inventive, just don’t ever see the light of day. They may be too expensive or too offensive to get past the network or its advertisers, or are shelved because of creative restrictions; with only twenty-two minutes to fill, you better be sure you’re putting all of your best work out there. Still, there has to be some sort of anguish in killing your darlings, in sacrificing an idea that was just too weird, expansive, or abstract for network television. With a new video series called Scene Unseen, Entertainment Weekly is traveling to the island of misfit scenes and reviving, through the power of animation, forgotten or discarded scenes that creators just couldn’t get to air for one reason or another. The first installment is glorious, with Keegan-Michael Key and Jordan Peele detailing an abandoned sketch that includes just about everything that makes their Comedy Central show tick. There are ‘80s-inspired wigs, a keytar, a nod to Teenage Mutant Ninja Turtles II: The Secret Of The Ooze, and a handful of strange celebrity cameos. The video is not only a wonderful behind-the-scenes peek at Key and Peele’s creative process, but also a reminder of the energy these guys bring to their sketches. Their eyes light up when explaining all the ridiculous possibilities of the sketch, and they sincerely belt out the parody song they’ve created. 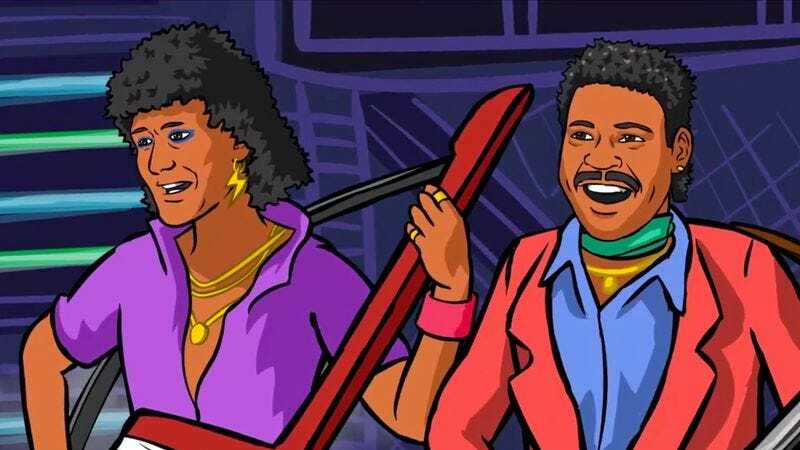 It’s a loving, hilarious ode to action movie songs that describe the very scene you’re watching. Check it out here, and don’t be surprised if you find yourself quietly singing the killer hook from “Aliens On The Run” at your desk today.